"For a long time I would go to bed early." While Proust's protagonist and alter ego Marcel lay awake listening to the sound of a distant train or watching the play of shadows on his wall, his thoughts were on his mother. In the first pages of his novel Proust's reader is introduced to the memories of a middle aged man as a young child. Marcel aches for the good night kiss he has been denied, and already we have a character whose life is intimately entwined with that of his mother, who hates to be apart from her, and who in turn focuses her life on her son; his fragilities, his illnesses, his sometimes contrary character, and his genius. As Proust's novel shadows his real life relationships the reader gets to see a mother and son whose lives revolve around each other. This vicarious introduction to Jeanne Proust (nee Weil) can only take us so far, and in her biography of Madame Proust Evylene Bloch-Dano traces the life of the remarkable Jeanne, placing that life in the context of the turbulent events of nineteenth century France, and of the emotional turmoil surrounding her older son. Madame Proust. A Biography was first published in French in 2004 winning Bloch-Dano the Prix Renaudot. Bloch has previously published a biography of Zola's wife (Madame Zola -1998) and is perhaps making something of a specialty of the lives of the female intimates of French male authors. 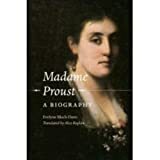 Alice Kaplan's 2007 translation of Madame Proust provides a welcome resource for Proust's many anglophile readers, and a useful companion to the several biographies of Proust that also touch on the life of his mother. The book is approachable to those who have not read, or have not completed Proust's novel, but some acquaintance with the novel is indispensable if the full import of Jeanne Weil's life is to be appreciated. Tadié's biography of Proust (Marcel Proust. A Life) is recommended by some as preparation for the Recherche, and it contains an excellent background to the Weil family, but Bloch-Dano, with the scope of a full biography at her disposal, goes much further. Her book is a sensitive and engaging portrayal of maternal love, and of Jeanne Weil. Proust's novel is a constant feature of Blach-Dano's work, and she makes many footnoted references to it. Her account of many of the events of Jeanne Weil's life relies partly on her own description, and partly on her analysis of how these events appear in the Recherche. It might seem then, that the object of this biography is as much Proust as it is his mother, but this would be misleading. Bloch-Dano discusses Weil's family life in detail, including the time before meeting her future husband Adrien Proust, whose social circle and tastes were very different from her own. Here, one can read of the influence of the rather more austere Adrien on Jeanne, and of her devotion to the three Prousts in her life, Adrien, Marcel, and her second son, Robert. Adrien Proust was a public health physician, devoted to his work, and highly regarded. In Bloch-Dano's account, this was an arranged marriage which grew into a loving relationship. Each had room for their own interests, Adrien in medicine, Jeanne in literature and translation. Jeanne's devotion to her family, and her domestically arranged life, shouldn't be read through a twentyfirst century lens; she manages to work within the patriarchy of the times without conceding her own values or interests. Adrien was a sound custodian of the wealth that came with his marriage to Jeanne, and his success as a doctor meant the family were well off. Jeanne had plenty of that most valuable of commodities, time. A devoted reader herself from childhood, she fostered the same quality in the young Proust, another personal characteristic readers of the Recherche will recognize from Proust's descriptions of his frequent retreat into the written word. Although she did not receive a university education, not at all unusual for the times, Jeanne Weil was well educated and proficient in English and German. It was her command of English, much better than that of her son, that enabled Proust's translation into French of Ruskin's The Bible of Amiens and Sesame and Lilies. In an interesting commentary on the place of Adrien Proust in his son's life, Bloch-Dano relates how following Adrien's sudden death in 1903, Jeanne exhorted Proust to complete his translations of Ruskin in memory of his father. When his translation of The Bible of Amiens was published in 1904 it carried an affectionate dedication to Adrien. Bloch-Dano also devotes considerable attention to Jeanne Weil's forebears, something covered in Tadié's biography, but not in such detail. In Madame Proust the exploration of these ancestors' lives sheds light on the social context and character of Weil, and gives us a richer understanding of the woman we feel we already know through the Recherche. One of the fascinating aspects of Jeanne Weil's life is her marriage to the Catholic (although personally areligious) Adrien Proust. Weil's family were Jewish, albeit non-practicing, and such matches were strategically shrewd, as assimilation could be useful socially and materially. The assimilation achieved through marriage must have had particular poignancy for the Weil family. A maternal uncle, Adolphe Crémiuex had served as Minster of Justice, in which capacity he signed a decree granting French citizenship to Algerian Jews. Jeanne's mother Adele attended the Crémiuex salon, where she met writers who we hear so much about in the Recherche, such as Musset, Hugo, and Sand, and where the letters of Madame Sévigné were a frequent topic of discussion. A thoroughly researched biography will turn up a few unusual facts which, if they are not central to the life of the subject, are interesting enough to include. Thus, in Madame Proust we learn that several generations back the Weil family was related to that of Karl Marx, making Proust and Marx distant cousins. The book even includes a special genealogical tree to show the connection. There's something you can impress your friends with. Just as the First World War forms a partial backdrop to Proust's novel, the Franco-Prussian war and internal conflict loom large in Jeanne Weil's life. Her marriage took place in Paris, the day after the French defeat by the Prussians. Despite an invitation the Prousts did not attend, due to the risks of travelling the hundred kilometers form Illiers in an uncertain political climate. Civil unrest was always a possibility in the capital and was rife in 1871, forcing Jeanne to move to Auteuil ("cursed Autiuel" according to Edmond de Goncourt), on the outskirts of Paris. Marcel was born while Prussian troops held the city, days after the violent suppression of the Commune. From Auteuil the sound of cannon fire could be heard. Even for the wealthy food was scarce, and the Prousts were reduced to eating horsemeat and worse. There are echoes in this of the extreme adversity in which Jeanne's mother was born in 1849, and Bloch-Dano weaves these events together to give a strong sense of narrative to her work. Another significant event in Jeanne Weil's life was the Dreyfus affair, and Bloch-Dano describes Jeanne as one of the early 'Dreyfusards'; those convinced of his innocence. She apparently shared this conviction with Marcel giving the two another bond, and one which set them apart from the many convinced that Dreyfus was a traitor. Proust left behind a huge volume of correspondence, including a large number of letters to and from his mother. This cache has proved invaluable for Proust scholars, and has provided Bloch-Dano with a useful window into the life and character of Jeanne Weil. Much of Madame Proust is written in the style of a novel, and in this sense won't satisfy the biographical purists. Chapter Ten begins with a description of the Proust family's train journey to Illiers: "The train slowed as it approached the station. Across the fields you could already see the steeple of the church…" a description that not only evokes the images of Swann's Way, it has something of Proust's descriptive narrative style in which perceptions are anchored to objective experiences, and of course the sight of the steeple is the occasion for one of Marcel's great epiphanies. I am not able to comment on the quality of translation from the French, except to say the book reads smoothly, and is without any noticeably jarring terms or images that would suggest Alice Kaplan was unable to find the right word or expression with which to render Bloch-Dano's original into English. Jeanne never got to see the full realization of Proust's literary ambition, but her contribution to it is palpable as Bloch-Dano's narrative unfolds. When Jeanne died at fifty-six in 1905, Proust remained at her side for two days "weeping and smiling though his tears". He had lost his mother, but the love they shared gave impetus to a work that would change the way literature was understood in the twentieth century.